Last year I only read 79? I must have missed some. I should also probably start a shelf about books about the Illiad that should encourage Anna to actually read the Illiad. This would include Illium and Olympos by Dan Simmons (aka the Trojan War on Mars in the future, with the “gods” as hyper-evolved humans. Such amazing books!) and the book I’m currently reading, The Song of Achilles, which is very lovely and sad. Maybe I’ll even read the original text sometime. 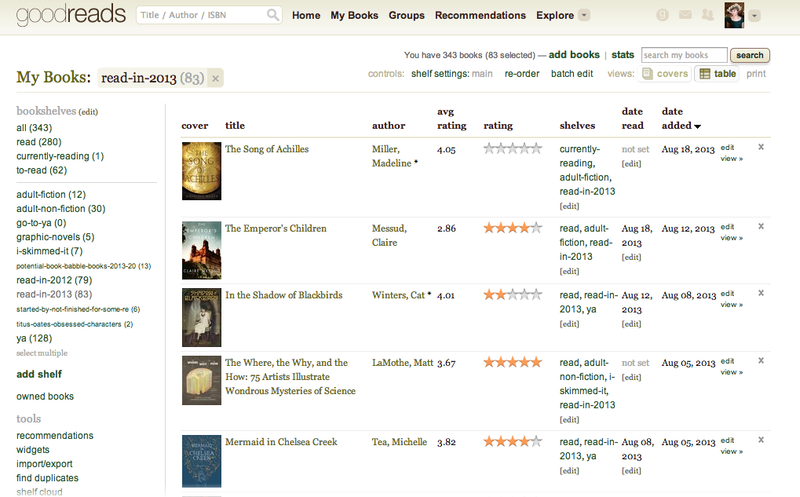 Does anyone else make weird Goodreads shelves or it just me? Next ›I’m a YALSA Protege! Yes! We just talked about this this morning. I will have to go check out your shelf titles with more attention in light of reading this post. Have you read A.J. Jacobs’ books? (I think that’s his name.) He writes those and I’ve heard interviews with him and he’s very funny! I haven’t read it yet, but I really want to! It does sound hilarious.